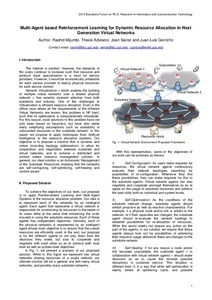 Mijumbi, R.; Serrat, J.; Gorricho, J.
Mijumbi, R.; Serrat, J.; Gorricho, J. Multi-agent based resource allocation in next generation virtual networks. A: Barcelona Forum on Ph.D. Research in Information and Communications Technologies. "Proceedings of the 2012 Barcelona Forum on Ph.D. Research in Communication and Information Technologies". Barcelona: 2012.